The Chapter starts with Lilia. Lute, Cheval, another kiddo featuring the Kometa Twins are running towards her, it seems that Simone “Miss Red Swan” has sent her a letter and this has finally come! Lilia is actually very happy for such thing since her role model has remembered her and is informing her! The letter it says that Simone is concerned about the wind incident and the sudden darkness that is appearing. Lilia says that she would like t investigate such thing and report her back. Meanwhile the adults where talking about what is happening, the black grass, the strong wild; everything… One of the villagers says that this remembers her to the incident that happened 12 years ago… the same age as Lute. In any case Dan and the other Riders will go to the forest to investigate. Back with our Heroes, Cheval´s Mom has given him some lunches for them to eat while they are exploring. Everyone gives their thanks to Cheval´s Mom, who also tells his Son to be extra careful, to not to do anything dangerous… Cheval says that he knows. She responds saying that since the wind incident she has been concerned about what is going on…Still she knows that in front of her there are various capable Riders, so everything will be fine. In any case she tells them to come back for Dinner, she will have something special for them! Suddenly Navirou´s whole body crisp, he says that he can feel a gaze and tells to Lute and the others that he felt a gaze, it must have been of one of the plenty of beauties who loves him so much! Navirou is a very popular Airou after all! …And it´s eating the delicious food that Cheval´s Mom made for them! Meanwhile Dan´s group who is made of the other Riders are already into the pitch darkness of the forest; Hyoro tells them that Maybe Lute and his team are around here too, Genie reprehends him telling him that he should have told them sooner. In any case, Dan hopes they don´t put a foot on the forbidden land. Back with Lute and the others. They are entering in the forbidden land it seems… They start remembering the first time they set foot on such lands, when they found that ugly statue that looks like Navirou and the Rathalos Egg. Navirou suddenly feels another gaze… Must be another Airou Babe who is eating him with her eyes filled with lust for this Ferrari of Airou!... In truth, the Nargacuga has been following them and looking at them, although it seems that this Wyvern has finally lost interest and is leaving. Suddenly a swarm of bees is coming towards our Heroes, so they start running from them! Just as with the Arzuros, they jump from the cliff to a river! After such incident Lute and the others find themselves again in front of the weird and ugly Navirou Statue… There are some ancient scriptures, Lilia tries to read them; but she fails to do so since her studies regarding ancient scripture are little to non. Suddenly an Arzorus has appeared and is running aimlessly in their direction! Arzorus the honey-craving Monster, this Beast is known for it´s love to the honey and it´s powerful claws which he can use to grab the opponent from time to time. This monster is one of the best first options for any hunter out there to confront! The Arzorus is running and clashing with trees and everything that it´s on it´s way! Lute tells Cheval, the Chief and Lilia to get out! Lute calls for Laeus and both of them will confront the Monster! Laeus attacks the Arzorus! Still the monster is far from defeated and keeps it´s rampage! It goes to attack Navirou; But the combined efforts of Lute and Laeus do the trick and manage to defeat the Monster, whose a weird scale fall from him, the Arzorus, now pacified walks off. Soon enough Cheval, Lilia and the Chief comes back to where Lute is. The Chief tells them that the thing that fell from the Arzorus came from the Nargacuga. Quick Wyverns who use their wings as blades and it´s Tail as whip and Kunai. In this case that is a Tailspike, so it came from obviously it´s tail. …Still such color is not normal. This Nargacuga has been infected by the “Black Blight”, an evil miasma who corrupts and darkness everything surrounds it: Plants, Monster and probably Humans too… The reason why such thing happens it´s still a mystery, the chief has sought such thing in the past… And so Lute´s parents. The chief tells the history that 12 years ago, when Lute was barely a new born, a Nargacuga infected with the Black Blight appeared in the village where Lute´s family lived; Lute´s Dad gave his life fighting the Nargacuga and protecting the village. Lute´s Mom sacrificed herself in order to protect her offspring… And so it was that when the Chief took Lute he decided to tell him the truth when he became a Hunter. Lilia and Cheval are concerned about Lute since this must be a shock from him… Lute then gives his thanks to the Village chief and tells them that he now knows why he wanted to be a Rider, because he wants to protect the village and everyone he loves; just as how his Mom and Dad did! That´s why he will be the best rider in the world! After that everyone goes back and Lilia says that she is sure that Simone knows everything that Lilia discovered today… The Chief says that is mostly sure, although it is good that Lilia is searching for answers. Chevals stops Lute and both of them share some words saying basically how awesome is the other. Lute says that Cheval will be an awesome Rider for his heart who understand and is open to everyone: Humans and Monsters. Both of them makes the vow to give their all! Returning to the village… Our Heroes remember that Cheval´s Mom said that she will have an special dinner prepared for them. When they get close, there are some weird lights in the village… A Fire?! The group makes haste in order to get back quickly! In the Village, Noel, the Aptonoth Rider, is injured he says that the Village is in Danger… The Nargacuga is coming here. Oh my God! This chapter was amazing! Perfect in every single way! 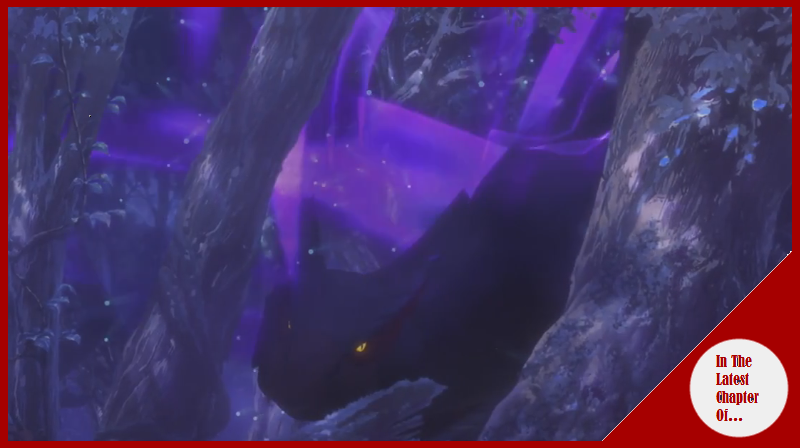 Man we already have what it is the true enemy, part of the mystery concerning Lute´s Parents; the Nargacuga is coming and even some flags of a tragedy. On this last regard, I will theorize a little and I will say that either the whole village will get destroyed, or a very deep and personal tragedy will come for Cheval; I am saying this because everything is pointing at him to be subject to such fate and even the rival of Lute. From his dark Kinship Stone which is different than the other Riders; all the fact that both Lute and Cheval are like Brothers and finally the whole focus in this chapter about how much Cheval loves his Mom and the trust and friendship Cheval and Lute has… It truly makes me think that the invasion of this Nargacuga will end in a tragedy for our good boy Cheval. Continuing with the Nargacuga theme, man the fight that it is coming will be so awesome! The first true test for our Riders!